Landscape painter and muralist, Ray Strong was born in Corvallis, Oregon on January 2, 1905. 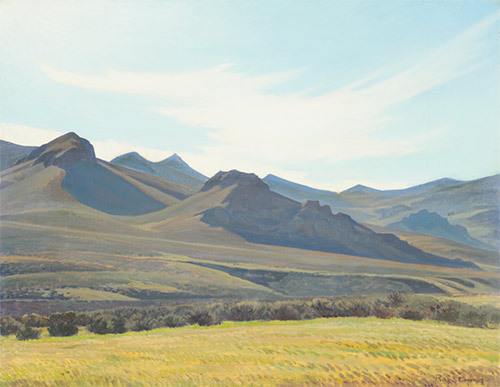 He began painting at age eight, and during his highschool years, spent Sundays with painter Clyde Keller working from the Columbia slough to Mt Hood. 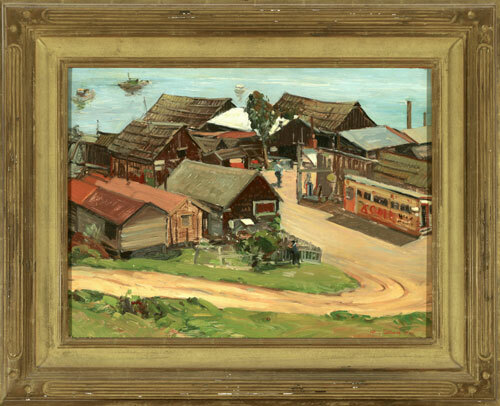 Upon moving to San Francisco in 1924, he enrolled at the California School of Fine Art, and from there went to New York City where he continued his studies at the Art Students League under Frank DuMond. Returning to San Francisco in 1931, Strong taught at the local Art Students League with Maynard Dixon, Frank Van Sloun, and George Post. Taking over the old Beaux Arts Galleries on Maiden Lane, they formed an Artists Cooperative Gallery from 1934-39. He did dioramas for both the San Diego Expo of 1935 and the Golden Gate International Exposition of 1939. Strong was a diorama painter for the U.S. Forest Service from 1935-38 and did similar work for the National Park Service during 1940-41.